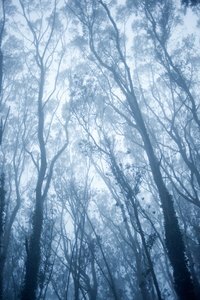 The rustling of the crescent leaves of the eucalyptus is a calming lullaby to those lucky enough to live near groves, and the fragrance is clear and fresh as hope. The magical tree (Eucalyptus ssp. ), however, has another, more practical side emphasized in its native realm: The more than 700 eucalyptus species include some of the fastest growing trees on the planet and are among the most widely used plantation trees, covering some 45 million acres. Eucalyptus trees define Australia, and most of the world species are present and thought to have originated there. They are the dominant trees in cultivated areas of the Australian continent and adapted to its many soils and climates. The Eucalyptus genus probably evolved from rainforest precursors as the continent and climate changed dramatically over the millenniums. Scientists assume that Australia is the point of origin and that the trees migrated via land bridges to nearby islands, including Timor. Tall, slender and graceful, eucalyptus trees are broad-leaf evergreens. Each of the hundreds of species offer different features, and some even have brightly colored flowers. The young, silvery leaves of the silver dollar tree (Eucalyptus cinerea) are rounded like coins. The silver dollar tree grows to 60 feet tall in Australia and to 10 feet tall in U.S. Department of Agriculture (USDA) plant hardiness zones 8 through 11, where it is hardy. Common eucalyptus (Eucalyptus globulus), also known as blue gum, bears elliptic, silver-green leaves. It grows to 180 feet tall in its native soil but stays somewhat shorter in USDA zones 9 through 11, where it is hardy. Many eucalyptus trees have peeling bark, and the bark together with the highly flammable oils in the leaves can create a fire danger. The first mention of eucalyptus trees in history came in the early 16th century when the island of Timor, north of Australia, was colonized by the Portuguese. It is likely that the trees' seeds were taken to Brazil, which was colonized by the Portuguese about the same time. Eucalyptus was first mentioned in writings in 1788 when French botanist Charles-Louis L'Heritier published "Eucalyptus obliqua," describing and discussing a species found in 1777 on Bruny Island in southern Tasmania. Common eucalyptus arrived in the western United States in 1853, imported as an ornamental. In subsequent years, it was planted for timber and fuel, especially in coastal areas. Because the tree propagates rapidly by seed and adapts to moist environments, it spread into the wild in foggy regions where it can shade out native plant communities and wildlife habitats. Eucalyptus trees also produce allelopathic chemicals that inhibit understory growth. Falling bark strips, limbs and branches create a physical barrier to growth on the forest floor. Moreover, the debris is extremely flammable, and eucalyptus easily becomes a fire hazard.